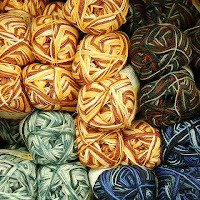 Yarn and Fiber Happenings: Schachenmayr Yarns are this Weekends Feature Sale Yarn - 40% Off! 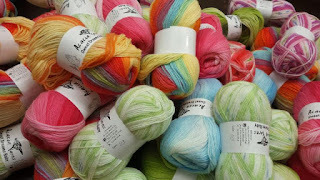 Schachenmayr Yarns are this Weekends Feature Sale Yarn - 40% Off! The Yarn and Fiber Company is proud to announce that a lace workshop with Galina Khmeleva will be held in the beginning of the week of July 20 (right before TKGA). Galina and I are still working on the format of the workshop and the exact dates but it is sure to be a wonderful class - she is awesome! Please give me a call if you would like to be added to the call list - this will be a first come, first serve class and is sure to fill fast (603/898/5059). If you are coming from out of state and need help with hotel bookings, etc. please let me know and I happy to help on this end. So extend your stay for TKGA and enjoy Lace with Galina, then onto the TKGA 10 miles up the road. What a great week! Also, we have just found out that designer Louisa Harding will be visiting The Yarn and Fiber Company in April, 2008. YEAH! Stay posted for the exact time and date... we have it narrowed down to one of the following days, April 16, 17 or 18th, but Louisa's schedule is not set yet. I will let everyone know the exact time and date as soon as we know. Welcome to the The Yarn and Fiber Company March Madness Sale! Each day a new yarn line will be put on sale at 12:00 PM EST - (except Sundays). Check back daily so you do not miss out on sales on your favorite yarns at a great price. The new Schachenmayr Regia Design Line Collection is an exclusive Special Edition of designer-inspired effects and colors. Designer Kaffe Fassett created the Mirage and Landscape color inspirations exclusively for Regia. Yarn requirement: Approximately 500g for a woman's size medium long-sleeve sweater; approximately 100g for a pair of socks. 2 skeins for 4-ply, 3 skeins for 6 ply, 4 skeins for 8ply). Regia can also be used for hats, mittens, scarfs and sweaters. Range due to different priced yarns in this category. Schachenmayr Punto yarn is a hard wearing yarn 55% Cotton 45% Acrylic yarn that is useful for more just socks (but it makes great socks too!). Please plan on 2 skeins for a pair of socks. Approximately 12 50g skeins are required to make a sweater. Sale rules and policies: Sale begins promptly on March 1st at 12:00 PM EST and ends on April 1st at 11:59 AM EST. Saturday sale post will run from 12:00 PM EST to the following Monday 11:59 AM EST. Yarn lines change daily at 12:00 PM EST. Your online order must be placed prior to 11:59 AM EST to receive the sale price for that day. All sale yarns are final purchase – no returns and no cancellations of orders excepted. Sale price does not apply to special orders or backorders. Sale applies only to in-stock yarn. No phone orders please. The Yarn and Fiber Company reserves the right to remove and/or add items to the sale on any given day at any given time without notice. 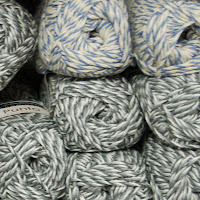 Items that run out of in-stock quantities may be removed from the online sale without notice as deemed necessary by The Yarn and Fiber Company. 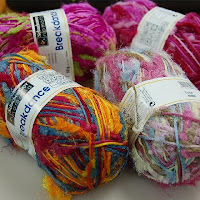 March Madness Noro Yarn Sale! Woohoo!